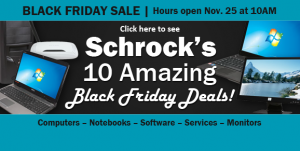 Amazing Black Friday Deals at Schrock Innovations! Schrock Innovations has some mind-blowing deals this Friday in all three Service Centers and the best part is you can sleep in and still get in on the action! On Black Friday (November 25th) Schrock will be open at 10:00 – normal business hours – which emans you can sleep off that Thanksgiving Turkey while your friends are out occupying the box stores. Discounts on Computers, Notebooks, Software, and More! You can pick up some of our Black Friday Deals and save as much as 50% off the regular prices. We have laptops, desktops, accessories, software and services all on special. See all of the deals on the Schrock Innovations website and don’t be late! 50% off sounds really amazing – unfortunately I’m a bit late. Do you plan to do something similar again before Christmas? Hey this is a great offer..Also a good day for giving the Gift for Christmas.Thanks for sharing this information.